The most challenging part of implementing a successful social media campaign is pulling in the relevant audience. Like in any other website, social media is driven by content. It is common to find Twitter accounts without followers and Facebook pages without fans. You have to provide value to get value. Below are a few pointers on how to effectively do so. The internet is filled with medical advice from quacks. Consumers of such information can end up complicating their conditions further. Healthcare institutions can help bridge this gap by providing those in need with proper information and advice through social media. You can provide simple solutions to common ailments and later follow up to determine the level of success. For complicated medical conditions, you can simply refer them to specialists in that field even though they do not belong to your organization. This helps build trust and validates your noble intentions. You should never indulge in self promotion in the social media space. Users find it repulsive. Social media enables you to have a one on one conversation with those seeking information. This builds your reputation and positions your institution as the go to source of reliable healthcare information. This is the most effective way of marketing your products and services at almost no cost. Social media can also bo effectively used to raise awareness about healthcare issues and be used to promote a health lifestyle. 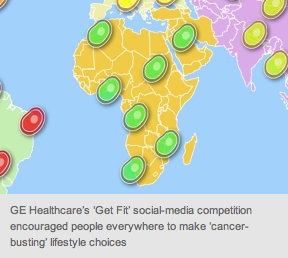 For example, GE Healthcare’s Get Fit social media competition on Twitter aimed to raise awarenss about cancer prevention and healthy living. The campaign elicited a strong response from the Middle East, with residents in Lebanon, Saudi Arabia and the UAE actively taking part to endorse a healthy lifestyle. The GE global campaign took place as competition between different continents, where Twitter users simply tweeted what they were doing to to strive for a healthier lifestyle, with each tweet including a country-specific Get Fit hash tag. The Get Fit website showed a map showing which continent generated the most ‘healthy tweets’. The winning country in that continent (as determined by open vote) received a $20,000 donation to the Red Cross or Red Crescent society operating in that country. Whether you like it or not, your clients are on social media and are talking about you. You can either choose to engage them or ignore them at your peril. To successfully engage them, you first need to listen to what is being said about your organization and others in the industry. This does not have to take too much time as there are apps that help you do this without too much of a hustle. There are many tools and specialists that can help you to track and analyze what is being said on Facebook, Twitter and other social media platforms. Listening allows you to fashion your communication with your audience according to their needs. Most healthcare providers make the mistake of throwing information at people yet they are unaware of their needs. Instead of waiting for your audience to initiate conversation it is most often prudent to do so yourself. Although your audience may have ideas and suggestions on how to improve your products and services they may not voice them unless prompted. You can leverage the power of social media to get feedback on any new products, payment procedures, doctor reviews and any other issues. During large scale disasters that require emergency medical response, a hospital can use social media to give the public updates on the status of the crisis. You can give hotlines for the public to call in case they are stranded, survival tips, number of casualties and any other relevant information. You can also help people find their loved ones who may have been admitted at your facility. A pharmaceutical company can share information on new drugs to fight epidemics and tips on avoiding infection. This will grow your influence among members of the online community as more people seek out and share the information you provide. 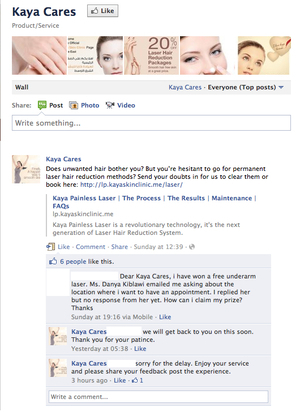 A good example of a healthcare brand actively engaging in conversation on social networks is skincare services company, Kaya Skin Clinic. The skin speclalist actively replies to queries on Facebook, resolving issues and there-by building strong relationships with customers. The most important thing on social media is reputation. You should guard it at all costs. Be truthful always. If an issue is raised, make sure that you respond to it and act accordingly. Failure to keep your word can damage the reputation of any healthcare institution irreparably. Check your social media accounts regularly for any requests or comments that may need immediate response. Hiring a dedicated resource to do so can be a good idea. To make your foray into social media successful you have to involve all the employees. Make it a team sport and they will gladly contribute to the growth of your influence in the social media space. At the end of the day, employees are people who relate with others on social media. By recruiting them as evangelists you can increase the likelihood of success in your social media campaign. Econsultancy’s next Social Media Marketing training course takes place in Dubai on 22nd February 2012.This one-day workshop looks at the effect of social media and web 2.0 on marketing communications and public relations and provides valuable hands-on techniques and tools to understand and harness the opportunities of User Generated Content. Book your place now. Glocal Connect? Ok, what’s up with the spelling mistake on an established website? An organization can adapt the phrase “think globally and act locally” to work for the digital space. In my organization it is: “Global Knowledge. Local Results.” The same can apply in any company, but with slight variations based on their own USPs from a Glocal perspective. You cannot be disconnected from the world anymore and claim to be just local or just global. Either way, being in the digital space means you have no choice but to be Glocal. In the digital era we are acting glocally all the time. We put a website up for the local market, and all of a sudden, we receive an enquiry from a country of which we haven’t even heard before. You can also see this when, a few hours after posting a CV on Bayt.com demonstrating local experience, for example, you learn that companies from abroad are trying to headhunt you. That is the power of online, or digital, or internet, or whatever you may want to call it. On a side note, I had sent an email to Merriam-Webster in 2005 asking to add this term to the dictionary but I never heard back from them. One day though, expect to see it added if hasn’t been already. It is up there on Wikipedia after all! Ok, let’s face it. Facebook is the top browsed website in world. Twitter is considered to be a “revolutionary” platform that can cause massive things including kicking out country presidents and entire government out of the window. With just these two, the world is changing dramatically, and nobody can ignore the power of social media. I remember chatting with a client 4 years ago about Facebook and the launch of twitter, and today their marketing strategy lives and breaths on them. So, WIIFM (What’s is in it for me)? Ok, guess what… you need to fish where the fish are. So if your target audience spend time on social media, who doesn’t!, then you have to be there in a way that is friendly and acceptable to them. End of day, all companies need to establish credibility, generate leads, and communicate with their target group. Social media can do all of that combined in one go. It is like marketing on strides.